An iLok key is required to authorize and use this product. All UVI products use the iLok system to unlock and authorize each instrument. 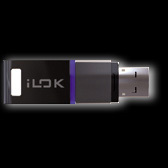 If you don't already have an iLok click here to purchase. 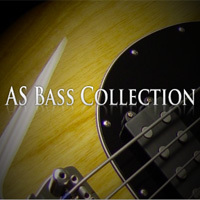 The AS Bass Collection is a bundle of 6 of our Bass instruments. You save up to 50% when buying this bundle! 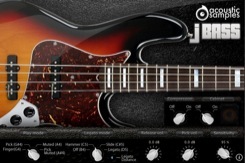 JBass is a four string American Fender Custom shop Jazz bass with flatwound strings. 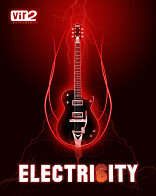 - Play mode: you can choose the playing technique, we recorded the bass using the fingers, a pick, playing it with the fingers or the pick with the palm muting the strings. - Hammer ons, slides, sustains, or simply have no effect. - Compression: you can turn the multiband combressor on or off. The Upright is Chinese 4/4 four string Upright bass (double bass) recorded from three microphone perspectives, a pair of overheads, one next to the F-Hole and the pickup. These three microphones perspectives allow you to shape the sound to give it more bass, roundness or detail (finger noises). - The Slap effect can be turned on and you can control its volume and sensitivity. 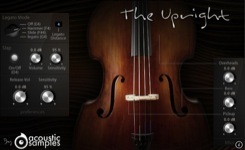 - TheUpright was recorded from three microphone perspectives and you can change the volume of each one from the interface. 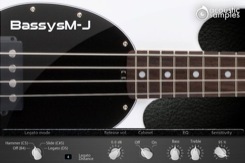 The Bassysm-J bass is a four string Musicman Stingray bass with roundwound strings. - Legato mode: you can choose whether playing a legato will trigger Hammer ons, slides, sustains, or simply have no effect. 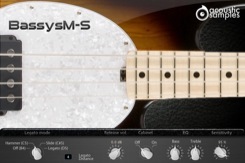 The BassysM-S bass is a four string Musicman Stingray bass with roundwound strings. The is the slapped version of the BassysM line. 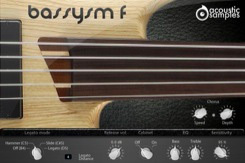 The Bassysm-F Fretless bass is a five string ibanez bass with roundwound strings. 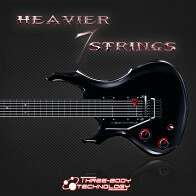 - Chorus: As this is a fretless bass, we had to add a Chorus module, and you can change the Speed and Depth of it. 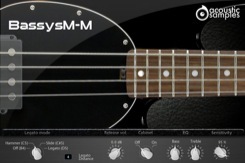 The Bassysm-M bass is a four string Musicman Stingray bass with roundwound strings. - 6 Velocity layers for the sustain (two round robins, so 12 samples per note). - 15 Velocities for the release. - Pick, muted and mick muted samples. - String noises played randomly. - Harmonics, ghost notes, string hits samples. - Advanced UVI scripting giving you access to a simple yet powerfull interface and advanced features. three microphone positions (overheads, bass microphones + pickup). - 6 Velocity layers for the sustain and two different takes for each note (2 round robins). - 14 Velocities for the release. - Pull Off on samples. - Advanced Vibrato effect controlled via modulation wheel. - Percussion samples with round robins (hits with the hand on different parts of the bass). - 11 Velocity layers for the sustain. - 12 Velocity layers for the sustain pop. - 12 Velocity layers for the sustain slap. - 2 round robins for pop and slaps. - 10 Velocities for the release. 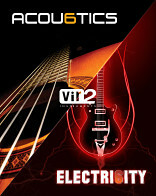 - We provide the MIDI files of the demo songs. - around 10 Velocity layers for the sustain. - around 13 Velocities for the release. All of our libraries are protected with iLok, an iLok usb key is required, as well an an iLok account. You can buy one anywhere (both V1 and V2 are working). The Following End User License Agreement is included with AS Bass Collection. This License is only valid for the individual who has purchased an unopened, new and lawfully made copy of AS Bass Collection from a dealer or distributor authorized by Big Fish Audio. Please read the terms of the following License Agreement before using any of these audio samples. By using any of these audio samples, you agree to become bound by the terms of the License Agreement. If you do not agree with the terms of the License Agreement, do not use any of these audio samples. You may use these Samples provided on this website, on a royalty-free basis, to create your own original music compositions or audio projects. You may broadcast and/or distribute your own music compositions or audio projects that were created using the Audio Content, however, individual audio loops may not be commercially or otherwise distributed on a standalone basis, nor may they be repackaged in whole or in part as audio samples, sound effects or music beds. No orders will be refundable given the numerical nature of our products. We stay at your disposal for any help or support. If you have any queries please do not hesitate to contat us. ALL RIGHTS NOT EXPRESSLY GRANTED ARE RESERVED. 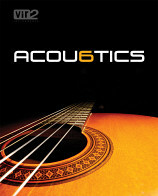 © 2011 Acousticsamples."